Philip Meyer took a series of photographs showing residents of the Blue River Valley as they prepared to move from their homes and farms as part of the Tuttle Creek reservoir and dam relocation project. 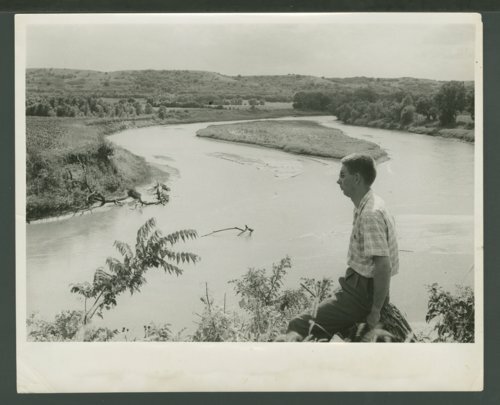 This photograph was captioned: "The Blue River, now docile after several years of drought, was a contributing factor in the flood on the Kansas River, according to Army Engineers. Valley residents argue that debris found upstream proves that the Blue was backed up by the rampaging Kansas River which it joins near Manhattan."